Like communism, Nazism, and other forms of statism, socialism is an evil ideology that is based on the notion that human freedom should be suppressed and restricted. Modern socialists may not have the totalitarian impulses of their national socialist and international socialist cousins, but their underlying philosophy is based on a near-criminal ignorance of economics and human nature. That’s why I always ask socialists to identify a single successful socialist jurisdiction. It’s fun to watch them struggle and sputter. They certainly can’t pick the nations, such as Cuba, Venezuela, and North Korea, that practice real socialism (i.e., government ownership of the means of production). They generally aren’t stupid enough to pick collapsing and stagnant welfare states in Europe, such as France, Italy, and Greece. Like Bernie Sanders, they generally point to nations such as Denmark and Sweden, though they never have a good response when you point out that: a) these nations became rich when government was very small, and b) they compensate for today’s bad fiscal policy with ultra-free market policies in other areas. But I’m not interested in a serious discussion about the flaws of socialism. Been there, done that, as the old saying goes. Hilarious, though one wonders whether a Sanders supporter is even capable of understanding the message that class warfare isn’t that much fun when you’re on the receiving end. Sort of like the message in this clever Penn & Teller video. P.S. 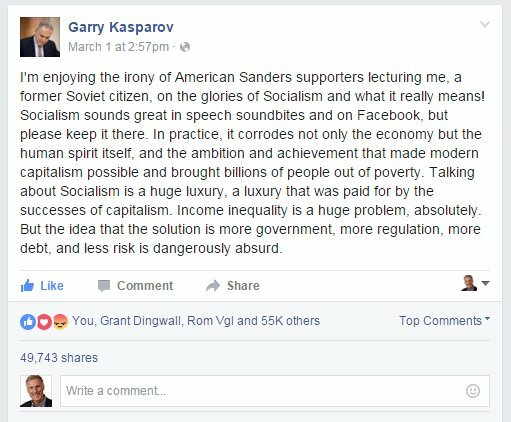 On a lighter note, here’s the “bread-ish” difference between socialism and capitalism. P.P.S. Regarding European socialism, we have great (although technically inaccurate) cartoons from Glenn Foden and Michael Ramirez. P.P.P.S. Here’s socialism for kids, though it’s really class warfare for kids. P.P.P.P.S. 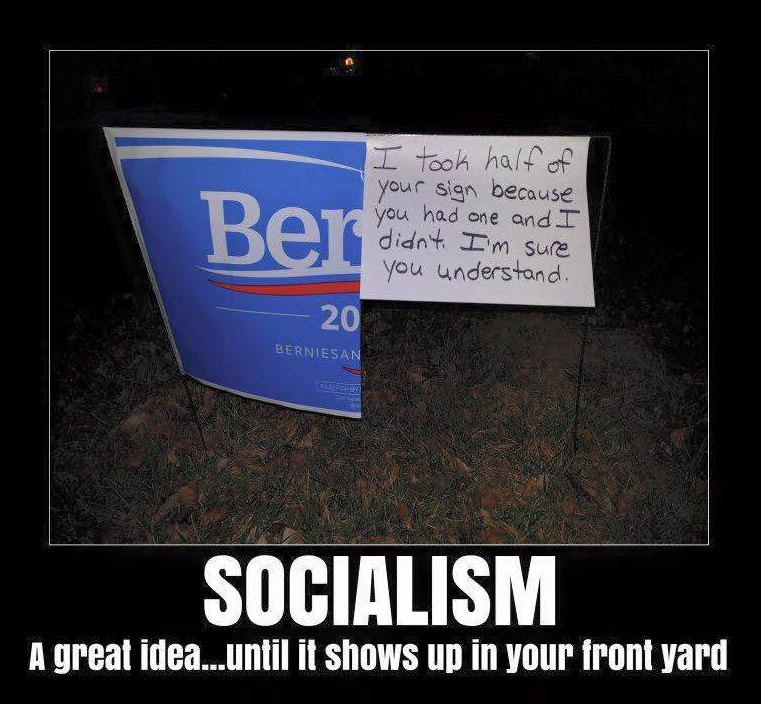 And here’s what happens when you try socialism in the classroom. This is a long article about an amazing failure. The retail discount store Target has a history going back to 1902 and has been a large and growing operation in the US since at least 1980. It developed a reputation for dedication to detail and expert performance. But, its Canadian project went from startup in 2013 to bankrupt in 2015. [edited] This is a story of a company trapped by an overly ambitious launch schedule, an inexperienced leadership team dealing with the biggest project in the firm’s history, and a sophisticated retail giant felled by the most mundane and embarrassing of errors. I see an example of one reason why government fails. Target had systems, expertise, and experience in retailing. But, they failed to transfer enough of this to a new, large project. Target had more experienced and trained people for its project than governments ever have for their projects, yet Target failed. So, there is little hope for government projects. Target and governments fail to comprehend the organic nature of successful growth. Hundreds of minor problems are discovered and solved during organizational growth. Problems solved 10 years ago are forgotten, and the lists for them are long lost in filing cabinets and computer files. There are always new problems which did not appear before and so have no chance of being solved by experience. This is Hayek’s Knowledge Problem; the knowledge needed to develop abd operate a large project is not known by any small group of people and is difficult to transmit in any short time. Target’s CEO saw an opportunity to start 124 stores in Canada by buying the real estate and buildings of a prior retail chain. He thought that Target could send its people over there duplicate what they were already doing. But, “duplicate” is a delusion. Target Canada was doomed by the massive scale of what they planned to accomplish. This is the repeated mistake of government, which always tries to do things on a grand scale. The problem for us peasants is that government rarely ends any project in bankruptcy. Government merely borrows more or collects more tax. the Scandinavian nations are in a state of flux… the resources necessary to support their traditional welfare systems are being consumed in order to feed house and care for their migrant populations… increased medical… legal and administrative expenses are stressing state budgets to their breaking points… serious reductions in welfare benefits are being considered and in some cases enacted… demographic shifts have put the future of the traditional Scandinavian welfare model in question… if current trends continue… 5 years from now… Scandinavia and the European continent will look and function very differently than it does today……………………….